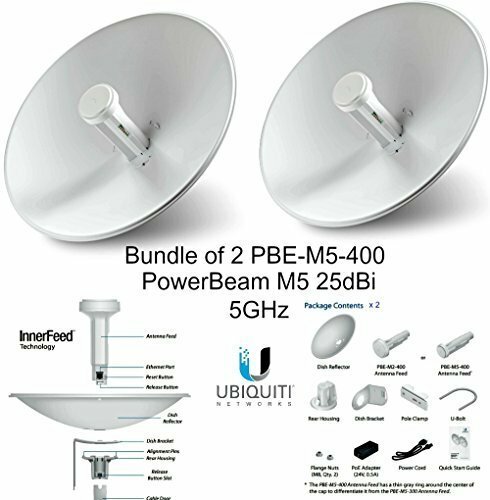 Ubiquiti PBE-M5-400 (2-pack) PowerBeam M5 25dBi 5GHz AirMAX CPE 400mm 150+ Mbps. With an all-in-one design, the PBE-M5-400 PowerBeam airMAX Bridge from Ubiquiti Networks is an airMAX product meant to function as customer premises equipment (CPE). With a more concentrated, direct signal clients benefit from improved noise immunity to as this bridge is capable of filtering out much of the noise that can degrade the signal. With Ubiquiti's own inner feed design installation of the PowerBeam airMAX Bridge has been greatly simplified as there is no longer a need for any cabling. Incorporating a dish reflector design with advanced technology, the Power BeamTM is the latest generation of Ubiquiti Networks airMAX CPE for customer locations.